At the beginning of the 21st century Turkey is once again rising to become an economic and political power, both in its region and in the world. The rise of Turkey is one of the last decade’s most important stories. Last year it grew faster than any other big economy except China and India. As the world’s 17th-biggest economy, Turkey has become a leading member of the G20 club. It has NATO’s largest army after the US. The reach of Turkish companies is also spreading. They operate not just across the region but around the globe. Many construction projects in the Middle East involve Turkish firms and workers. Turkish Airlines, has turned into a global force as Istanbul, now Europe’s biggest city by far (at around 15m), has become an aviation hub. 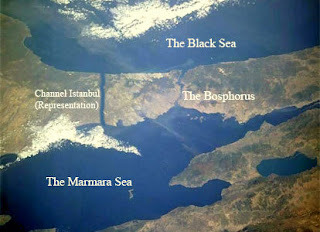 In the run up to the latest Turkish elections, the ruling AK party which won a new mandate on 12 June 2011, pleged to build another bridge across the Bosphorus and more spectacularly a new canal linking the Black Sea and the Sea of Marmara that would be a match for the Panama Canal. This project was first proposed by Sultan Suleiman the Magnificent in the 16th century. The new canal will be called 'Canal Istanbul', it will link the Black Sea to the Sea of Marmara, which leads to the Aegean Sea. The new waterway will be located on the European side of the Bosphorus. Its main purpose is to reduce the heavily congested tanker traffic through the Bosphorus Strait and to minimise the risk of accidents. The proposed Canal will have a length of around 48km with a depth of 25m, a width of 150m on the surface and 120m at the canal bed. This will allow the largest vessels to pass. The project is intended to be completed in time for the 100th anniversary of the Turkish Republic in 2023. Turkey's location between Europe and the Middle East lends it huge geo-trade significance, not least as an energy and pipeline corridor. Over the last decade, it has developed closer relations with Georgia and with Iran, Iraq, Syria and other Middle Eastern countries, to the consternation of its traditional allies, the US and Israel. Azerbaijan provides Turkey with access to the energy-rich Caspian Sea states of Kazakhstan, Turkmenistan and Uzbekistan. Turkey is also a strong supporter of the 1,768km Baku-Tbilisi-Ceyhan pipeline that runs from Baku to its Mediterrenean port of Ceyhan. The EU accounts for 75pc of foreign investment in Turkey and roughly half its exports and inward tourism. Turkey is Europe’s third-biggest producer of televisions. Likewise, Europe's energy security depends on the transit of oil and gas from Central Asia and the Middle East through Turkey. Europe in its history has had an uneasy relationship with Istanbul during the Ottoman Empire, in fact, some might say that Europe has been almost defined, through the centuries, by a tension between Christian and Islamic boundaries and by Muslim encroachment in Europe from the East and the South. To some extent, in some European countries, this view still pervades policy makers today when considering Turkey's accession to the EU. Today the EU needs to ensure that it does not turn inwards and become fixated on internal questions. There is a real danger that Islamic identity is defined as 'the other' and while this debate ensues, Europe misses the bigger picture of what is happening in the world in the 21st century. The EU – with 330m people alone in the Euro-zone area has a key role to play in the 21st century. But it needs to remain outward-looking to understand the changes taking place in emerging economies and in the greater world in Asia-Pacific to become an active global player. In the 21st century, Turkey is the closest thing Europe has to a BRIC. The EU must find ways to enhance its relations with this important new emerging regional power. Perhaps through a Special Economic Zone to provide access to the EU internal market, the EU's greatest success to date. Then maybe with the option for Turkey to join the Euro too if it meets the fiscal criteria. Turkey could also be invited to join the Schengen agreement to enable free movement of persons through the Schengen Member States. Europe needs badly to embrace Turkey, it needs the fresh perspective and energy of the Turk people and to harness the economic firepower of an important emerging economy on its dooorstep.